*BUTCH DIVA, the Brooklyn-based fashion haus that I have featured before on my blog, has a new collaboration with Jamaican-bred artist Robin Clare. They teamed up to create a series of posters that combine Clare’s signature dancehall dancers motif and BUTCH DIVA’s most famous silhouettes. The “BD x RC graphic art collaboration” features a collection of six 16″ x 20″ colored art posters designed by Clare. These various illustrations are inspired by the 90’s pop-deco BUTCH DIVA summer 2013 collection, resulting in full page patterns created with Robin’s signature dancehall inspired gyals in motion wearing classic Butch Diva creations. The posters can be purchased on BUTCH DIVA’s online store. *”Afrofuturism in Short Films” at Goethe Institut Washington on February 3rd, featuring Pumzi, Drexciya and Hydra Decapita. *”What Octavia Butler Means to Me:” Walidah Imarisha writes about why Octavia Butler is important. *Kenya Robinson‘s “Practically Magic:” She writes about her whitemaninmypocket juju talisman that she uses for protection against white ignorance encroachment and supremacy. *Onyxcon Sankofa will be on March 1st at College Park, Georgia. *”Who Killed the Funk? :” Michael A. Gonzalez askes why there are so few funk bands today. *An Evening with Octavia’s Brood at EMP Museum in Seattle on February 28th, . *Chadwick Boseman who will be playing James Brown later this year in Get On Up was chosen to play Thoth in Gods of Egypt. After a huge controversy and a petition, which you can still sign, against white actors chosen to play these gods, this is a tiny consolation. *Nalo Hopkinson interview on CBC’s The Next Chapter: “I sort of think the very fact of existence is magical.”– Nalo Hopkinson. Donate funds and speculative fiction books to the cause! 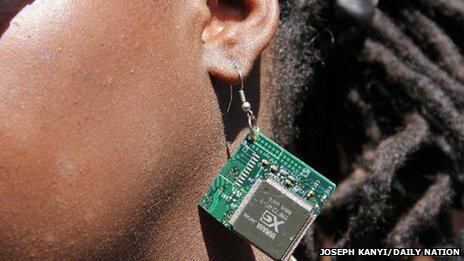 *David Nderitu, a young Kenyan boy, makes jewelry out of e-waste. “Where ‘American Horror Story: Coven’ Went Wrong:” The ending of the season was flat, rushed and awkwardly resolved everything in conjunction with the rest that went wrong, and this article voices most of it for me. Tunde Olaniran – “Brown Boy” now on Quite Scientific Records. Look for his Yung Archetype EP, which will be out February 25. *Trailer for the Afro-Brazilian film The Summer of Gods, which pre-screens tonight in Oakland.